Looking for a taste of the wild for your holiday celebrations? Nuts are found in many forested areas around North America, and many offer a surprising and tasty treat. In September, while hiking on the Tongue Mountain Range on the western side of Lake George in New York’s Adirondack Park, I found the most curious looking tree. The bark hung in long strips from its base to deciduous top. As in a fairytale, I half expected a bearded, old tree-man to blink his eyes at me from under unkept woody eyebrows, but no magical awakening occurred. The grove was intriguing just the same. The shaggy hardwoods I had discovered are appropriately named, shagbark hickory (Carya ovata). Native to the Eastern U.S. and southern Canada, they can grow over 100 feet tall and live 350 years. The grove on the Tongue Mountain Range was half that height, but it had been there a while. Only mature shagbark hickory trees have shaggy bark, and these were laden with unripe nuts. Shagbark hickory nuts are edible and sweet tasting. 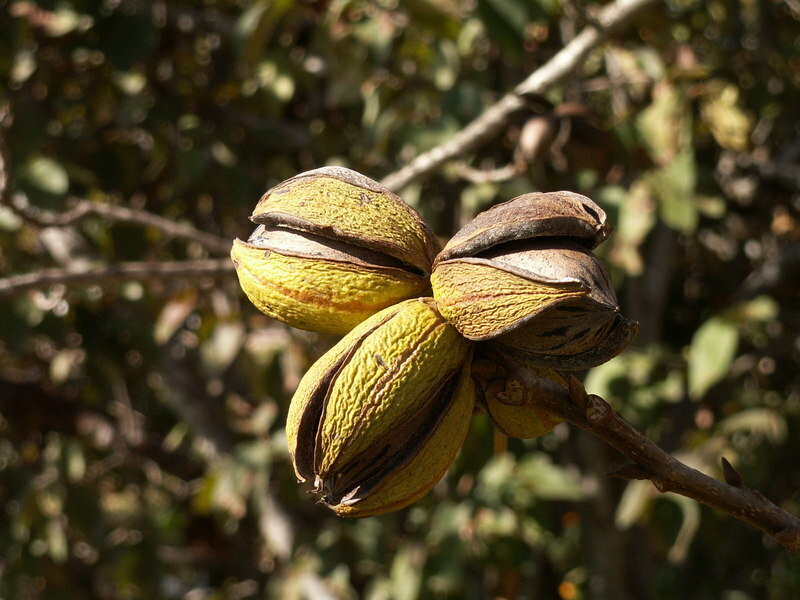 In recipes, they can be used as a substitute for pecans, with which they can hybridize. The early Algonquins, who inhabited the Lake George region prior to European settlement, harvested them in great quantities to eat as nuts and to make into a milky drink, called pawcohiccora, from which the English word, hickory, is derived. Shagbark hickory nuts are also an important food source for a variety of animals including squirrels, raccoons, field mice, bears, fox and some birds, such as mallard and wood ducks, bobwhite quail and wild turkey. Wild nuts are a forager’s delight: easy to identify and usually easy to find. They’re packed with nutrients and heart-healthy fats and oils. Even though individual trees don’t produce annually, there’s always nuts in the forest each fall. There are a variety of edible nut species out there for you to enjoy. Here are some you might find on your next woods walk. Wild pecans (Carya illinoinensis) live in the lowlands of the deep south, but, as their Latin name implies, you can also find them in river bottoms as far north as Illinois. Native Americans ate and traded this sweet nut long before the earliest Spanish explorers first sampled them in what is now Louisiana, Texas and Mexico. Later this native nut found its way into Thomas Jefferson’s orchard at Monticello, his home in Virginia. Jefferson then gave pecan trees to George Washington for his Mount Vernon estate. Wild pecans taste the same as cultivated ones but are smaller and easier to remove from the shell. They grow best where summers are long, hot and humid. And they’re durable. You can usually still eat them even after they have spent a winter on the ground. Also called American filberts (Corylus americana), wild, native hazelnuts taste like the cultivated kind, but are half the size. Though you can eat them raw, they are especially yummy when roasted or ground into a pastry paste. Don’t forget to remove the thin, brown skin for the sweetest praline flavor.